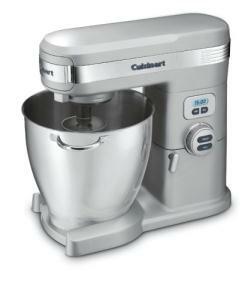 This Cuisinart model stand mixer provides a thousand watts and twelve speeds for preparing larger batches of ingredients. This unit offers both slow start and gentle fold functions. Three power outlets host a variety of attachments: meat grinder, pasta maker, juicer, blender and food processor (all sold separately). The stainless steel bowl holds seven quarts and the body is made of die cast metal. Other features include a fifteen minute countdown timer, auto off, and a tilt back head with locking option. A chef's whisk, flat mixing paddle, dough hook, and splash guard with pour spout are included. The machine comes with a three year warranty and the motor has a five year warranty. This is not a commercial grade mixer and the capacity listed in the product information may be a bit exaggerated. Some people find that the mixer cannot handle extra large batches; the dough climbs the hook, seeking escape, or the motor fails. Even so, it does handle larger batches than most mixers. The attachments are strong and well designed. The bowl shape is just right to help keep ingredients contained and aid in thorough mixing. As long as you work your way up and don't go for the maximum tolerance with your first attempt, I believe you'll be pleased with the performance. The user guide has excellent, helpful tips on food preparation and baking. It is worth a read. The whole machine seems to be well designed, providing ease of use and a number of very nice options.